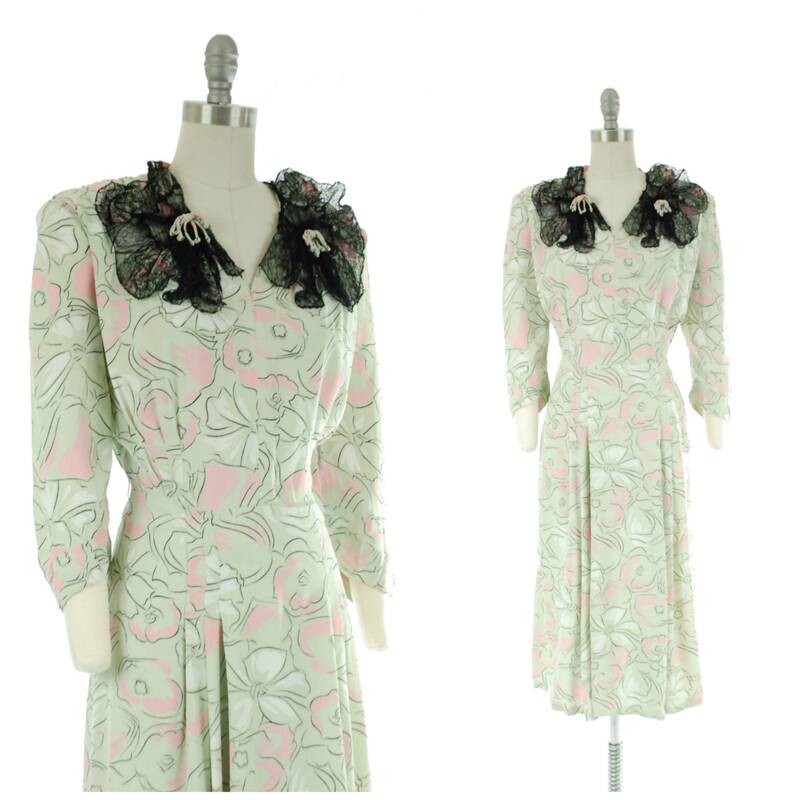 Vintage 1940s dress in a dreamy pale green hue, made of a lightweight rayon crepe. The pale, minty green is paired with true pink, a touch of white and a black line work of flowers and bows. The bodice has a beautiful shape with gathered to blouse. There is a pleat at each side of the padded shoulders. The neckline is embellished with fine black lace frills. There's appliqued flower shapes on the backside of the lace, and there's piping bows at each corner of the neckline. The three quarter sleeves are darted to fit around the curve of the elbow. The skirt has triple darts at each side of the slightly flared skirt. The dress is perfect for spring and summer, breezy and light. It closes with a sturdy metal side zipper. The waist of this dress was professionally altered in with additional darts and along the the left side seam. Because it was so thoroughly done, it would be hard to take out fully, but it can probably be let out to about a 32" with moderate effort. This dress is freshly dry cleaned and ready to wear. As noted, the waist size was altered in the past. The hem is machine finished. There's one tiny snag on the right sleeve. I find no other issues to note!